In the past month or so, I’ve been to three very different kinds of conference: one academic conference in my field, one NUS LGBT conference, and one postgraduate symposium in my department. They’re all quite different, both in aims and the experience they provide. The academic conference in my field was perhaps the most straightforward. There were concurrent sessions organised by panel, each paper lasted around 20 minutes + 10 minutes for questions. It was focused on corpus linguistics, my primary field, but as corpus linguistics encompasses a huge range of things, I still found new, unfamiliar and exciting things. As a PhD researcher, it’s rewarding to go to specialised conferences in your area and find yourself getting more and more familiar with the field; I remember my first conference in 2007 and just being dazzled by it all, whereas now I think I’m more confident. The NUS LGBT conference was about making policy, sharing knowledge and experience in workshops, and returning us to our university LGBTs as fired-up, knowledgeable, passionate activists. There’s lots of slightly unfamiliar terminology and processes – that of zones, motions, amendments, parts, speeches for and against, “I see that delegate there” and so on. I don’t think I’m the only one who’s haunted by the words “seal the doors!” and “we’ve had a request for parts…” The needs of participants were key, and of the three conferences this one was perhaps most explicitly concerned with accessibility. I found it was also the most personal of the three conferences in that it really makes you re-examine and reflect on your beliefs. The third, held in my department, was actually the first postgraduate symposium I’ve attended. It was organised into panels, apparently by supervisor – this effectively grouped similar areas together. 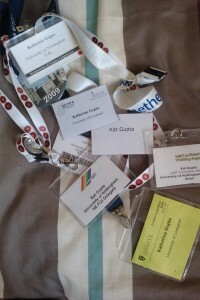 It was the first really cross-disciplinary conference I’ve attended; I’ve tended to go to conferences organised by field rather than experience. While we were encouraged to consider our audience and not make our presentations too specialised, some people seemed to forget this. I did see some really interesting presentations and got to see research in areas I’m totally unfamiliar with – I particularly liked the Norse and Old English presentations – but some presenters completely lost me. However, it did meet its stated aim of showcasing the variety of research happening in the School of English Studies. Practical things first: if you are anything other than enthusiastically omnivorous (and I really do mean “enthusiastically” and “omnivorous” – have you seen those canapes? ), be prepared to compromise when getting food. If you’re a vegetarian or vegan, make sure you’re at the front of the queue so curious omnivores don’t go “oooh, those spinach and pine nut tartlets look good, I’ll have one” and wolf them down before you even see a crumb. Fact is, you’re not going enjoy a conference if you’re hungry and cranky, and you’re not going to get much out of it if you’re thinking about where you can get food rather than the implications of diachronic multi-modal corpora. Drinking can be fun if you’re into that sort of thing, but I can almost guarantee that the thing you really want to go to will be at some ungodly hour the next morning. Presumably you’re old enough to make the choice between hangover, sleeping in and missing the thing you wanted to go to, and limiting your alcohol intake. Choose wisely. You don’t have to go to everything! Conferences can be quite intense, so it’s fine to miss a presentation or two to give yourself some time to yourself. If there’s nothing on that really interests you, take yourself off for a coffee or have a walk around the venue. At my first conference I felt I had to go to everything and was exhausted by the end of it – now I realise that it’s okay if I don’t. On the other hand, conferences are also great for discovering new things. They bring together people with expertise in different areas, different views, different areas of interest. It’s an opportunity to find out about things you’d never considered or make new and unexpected connections to your own areas of interest. Go to a few things that sound interesting that you feel you don’t know enough about. Talk to people! You are, with any luck, surrounded by people who do interesting things. Conferences offer you opening gambits – you can ask people what they thought of that last presentation, ask them something about their own paper, or, if you’re British, complain about the coffee/food/accommodation/weather (I jest). There’s probably something coldly tactical to say about networking and getting your name out there, but at least part of it for me is pure, nerdy joy at talking to people who care about the stuff I care about. I did have a mental list of other suggestions, like “if you’re going to nap, do so in the back row because it’s not very nice for the speaker to see you dribbling at the front” but that’s probably not very helpful. Anyone else got any conference tips/suggestions/advice?